Here's an unusual item featuring Herschel, which I recently obtained for the Hoard. 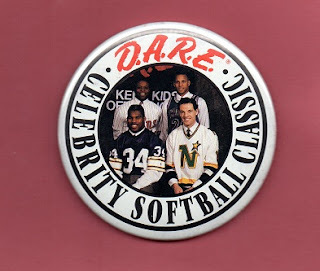 This is a pin promoting the D.A.R.E. Celebrity Softball Classic. D.A.R.E. stood for Drug Abuse Resistance Education, a program set up to highlight the dangers of drug abuse, especially to children. Herschel Walker took a strong anti-drug use stance during his career. From what I could find, the event took place between June 28th and 30th, 1991; at the University of Minnesota. Walker, of course, played for the Vikings at this time, and can be seen in the lower left of the image, in a purple Minnesota Vikings jersey. I think the man seated to Herschel's left might be Neal Broten of the Minnesota North Stars of the N.H.L. I don't know who the other two athletes pictured are. One is in a Minnesota Twins uniform. I thought maybe it was Kirby Puckett, but I don't think so. The other guy is what looks like a basketball jersey. If anyone reading this knows who the other guys are, please leave a comment and let me know. Al Newman is the Twin, most likely it's Pooh Richardson of the Timberwolves as the last guy. Thank you sir, I appreciate the update.